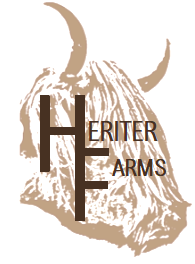 So it's been a very busy couple of days here at Heriter Farms. Yesterday we moved the teenagers from the barn to pasture and got them staked out. Other day to day activities. 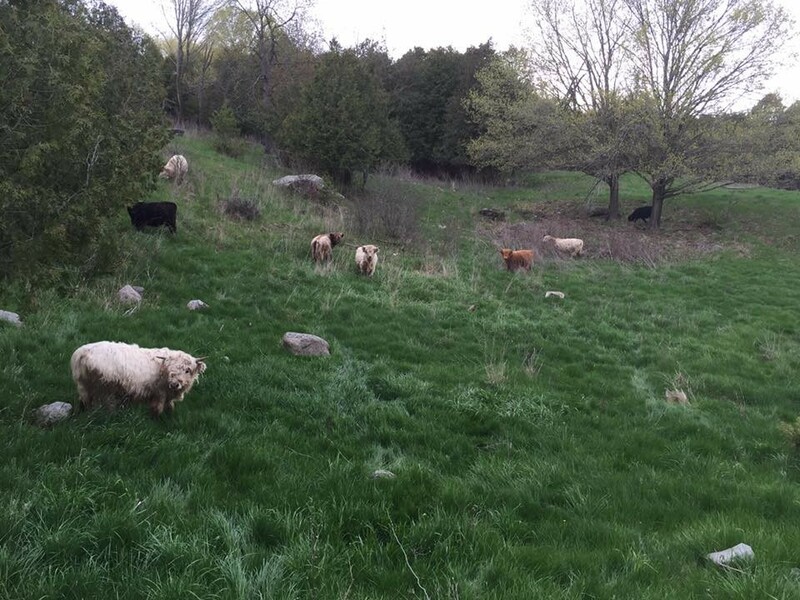 Today the adult cows were moved to pasture (much less stress that moving the teenagers). Then we tagged the new calfs with ID and rfid tags (radio frequency identification display), stressful but not too bad. Then moved them to the pasture with the teenagers. Then moved Brutus from his area onto fresh pasture that we want fully chewed up for planting (very rich soil that will be great for squash and pumpkins for winter pig feed). Then moved the pigleys, and their house, onto pasture close to Brutus. Tomorrow Daisy and the Tammys get moved. That's gotta hurt! 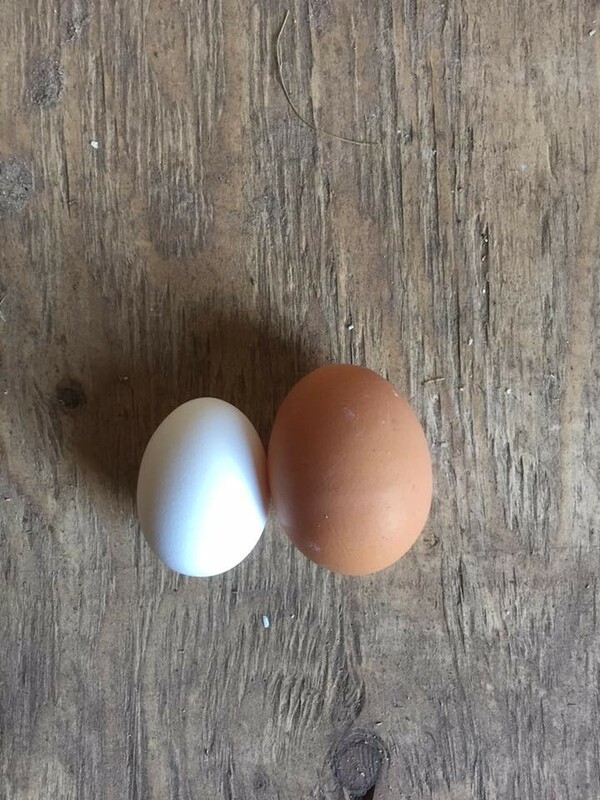 So the egg on the left is a store bought extra large egg, the brown egg is a just laid organic egg from my chickens. And they are all normal size chickens. So that one has to hurt lol! Who knew, chickens lay eggs at all times of the day. First 24 hours of bringing them home and they delivered 17 eggs in total. And 10 weren't supposed to be laying yet. I'm very impressed, looks like I made the right choice in chicken breeds. 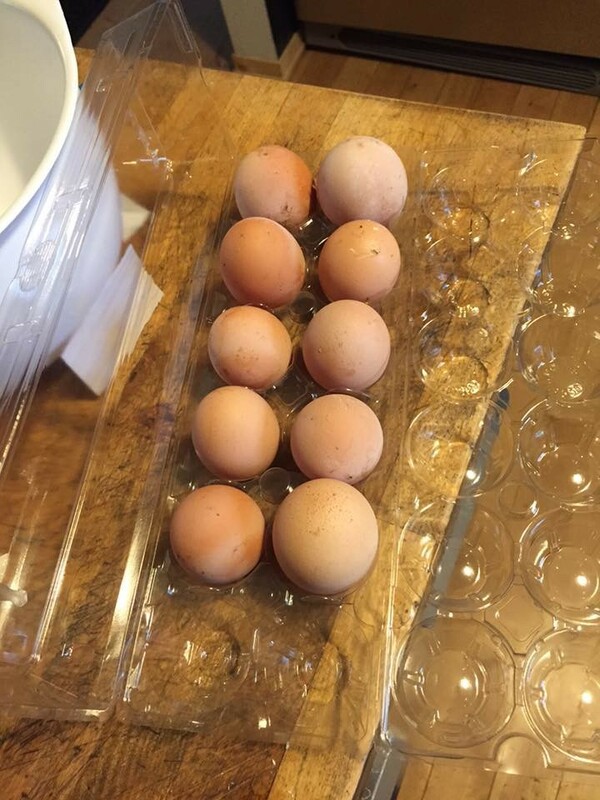 And we have eggs, 10 for 10! 10 birds are old enough to lay and 10 did, very surprising as they usually stop for a day or two because of stress (moving). Nice. Picked up 20 Organic Rhode Island Reds, 2 age groups, first is already laying, 2nd group will be laying in a couple of weeks. 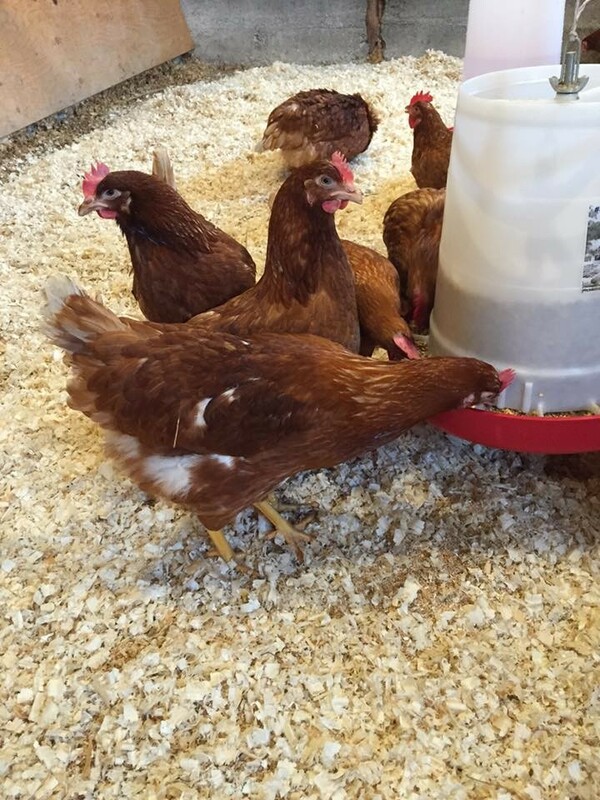 Chose these birds as they are hardy, prolific egg layers and have pretty good disposition. No rooster yet as I want to learn about them without the distraction of a busy male around. According to Ontario's ridiculous laws, I'm limited to 100 layers and 300 meat birds, that is unless I want to spend $1.5M for quota. I can have any number of cattle or pigs but you are limited with poultry. Oh yes, I can raise 50 turkeys. So happy with the birds, they are important to the whole cattle/ pasture development process, plus I love eggs and chicken. They will spend the summer on pasture, fresh air, bugs, lots of ground scratching, some worms when it rains while spending nights inside movable chicken houses for protection from the fox's, coyote/wolves, raccoons and weasels. Farmer lesson....Electric fence. As most of you know, I've jumped into full time farming with absolutely no experience in farming. If it wasn't for the internet, youtube especially, I would not have been able to do it at all. So, having no farming experience, I had no knowledge/experience with electric fencing. Remarkable stuff. Today's electric fence is relatively cheap, easy to work with, comes in many styles (single/multi strand, netting etc). One thing that hasn't changed is it delivers very high voltage but almost no amperage. Result, it hurts but doesn't damage. I've got zapped many times in the last 5 months since I got the Highlands, they all surprised me, a few even made me cuss a word or two (ok, almost always and sometimes three words). Well today was a WHOLE new experience. Turns out, even if you are wearing gloves (ok, thin gloves) you can get zapped. ESPECIALLY if you touch the wire and 1" away you touch a bare metal post that is buried in concrete (in other words, a PERFECT grounding rod). Well, let me tell you, that caused more than a few cuss words proceeded by a scream of pain that caused my helper to assume I'd been gored by one of he Highlands (I was in the feeding trough doling out the evening feed). From my kneeling position, it caused me to drop to my knees, I said I was ok but man did it hurt. Felt like the base of my thumb had been instantly cooked. So, another farmer lesson that I'm sure I won't forget. Meet Edward! 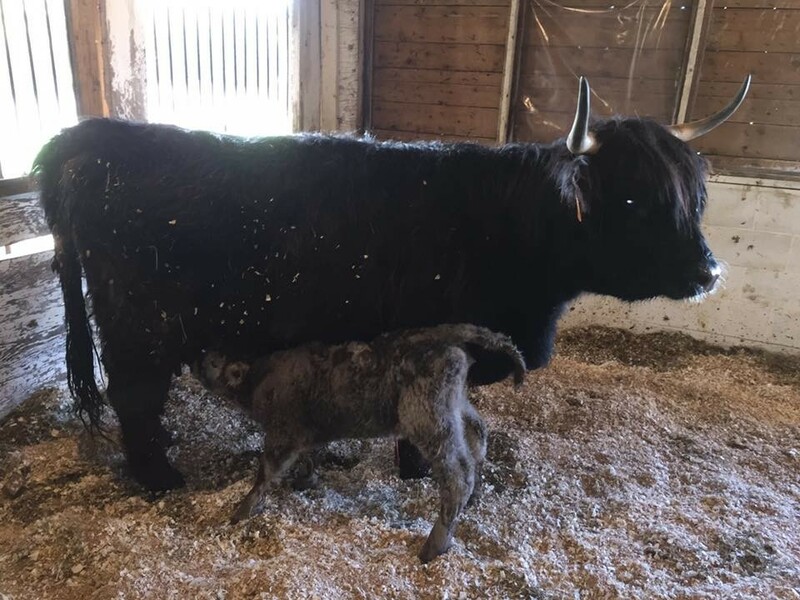 So I confirmed he is a boy, so he gets a royal name as the first male calf born at Heriter Farms. He's an unusual grey that I haven't seen before in any of the Highlands when I've visited other farms. 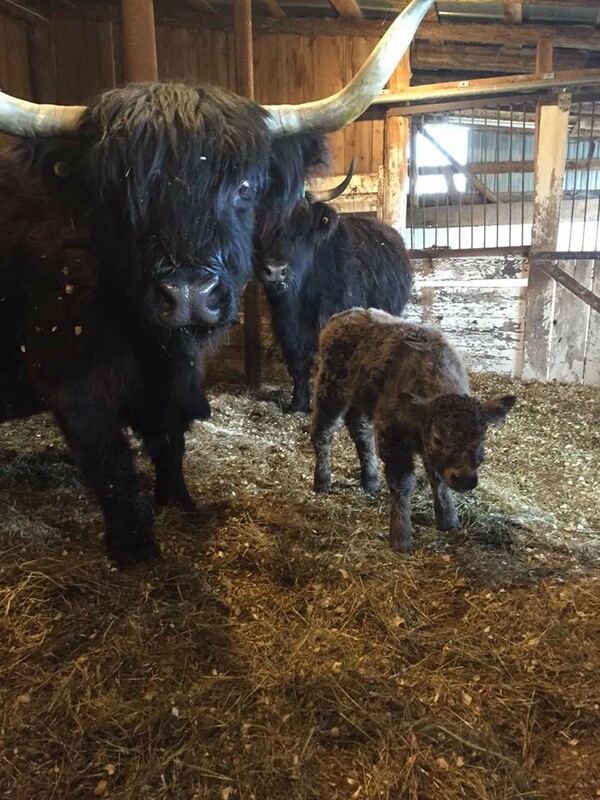 Not sure if he will stay this shade or change but he's a good size calf and Pearl is being an attentive mom as all Highlands are noted to be. 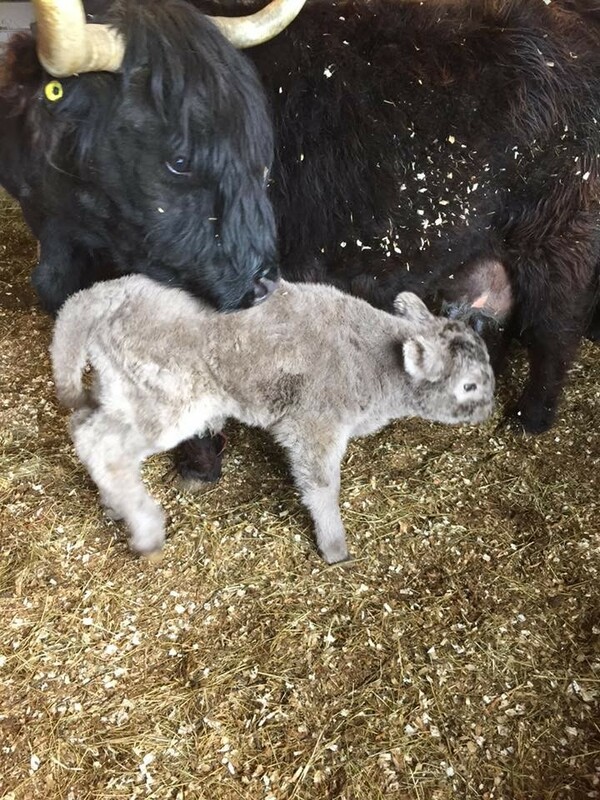 So new calf has arrived, first baby born at Heriter Farms in the afternoon. Born shortly before this photo was taken, momma Pearl is being pretty protective. Got close to the baby but not too close before she waggled her horns, snorted, and took a step forward. So, backed off. Can't tell if male or female so no name yet (to be chosen from the list everyone suggested), will try tomorrow. 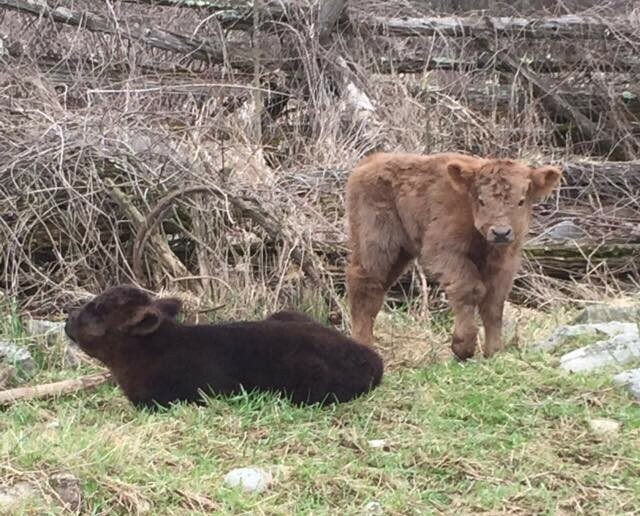 Eve and Elsa (black and dunn respectively) are now sleeping out on the pasture where they belong. They sleep close to each other and are becoming best friends, as shown by their playing together. Lucy being a great mom, laying down and blocking her babies into their sleeping area so they stay warm under the heat lamp. Zennia doing her Highland cattle pose ("Yes, I'm big and beautiful") on a hill. This was just before she came down to within a foot of me to keep an eye on me as I was close to Eve. And finally, me milking a cow! Satin actually as Elsa was having difficulty latching on the first day so we milked her and bottle fed her. Happy to say she is now doing great by herslef. Calfs playing, no more need be said! But I will anyway. Went out to do the evening feeding, checked on the calfs and moms now that they are on pasture and saw Eve and Elsa head butting each other and playing. Very cute. And great to see as it means they are healthy and happy. And yes, I watched for much longer than this video. Way too much time watching babies lately, both pigs and cows.